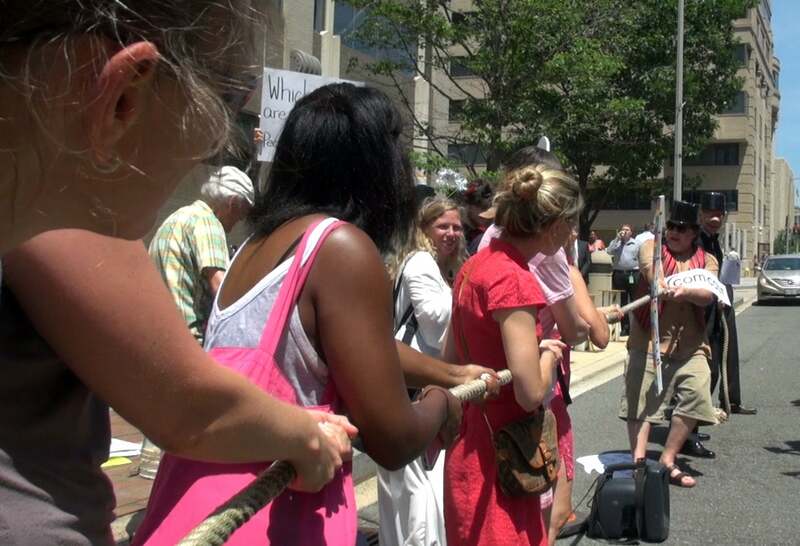 WASHINGTON–The tug of war for an open Internet took a turn for the literal Tuesday as protesters staged a piece of street theater in defense of net neutrality. About 30 people assembled on opposing sides of a large rope labeled “The Internet,” with the telecom industry on one end, and the people on the other. 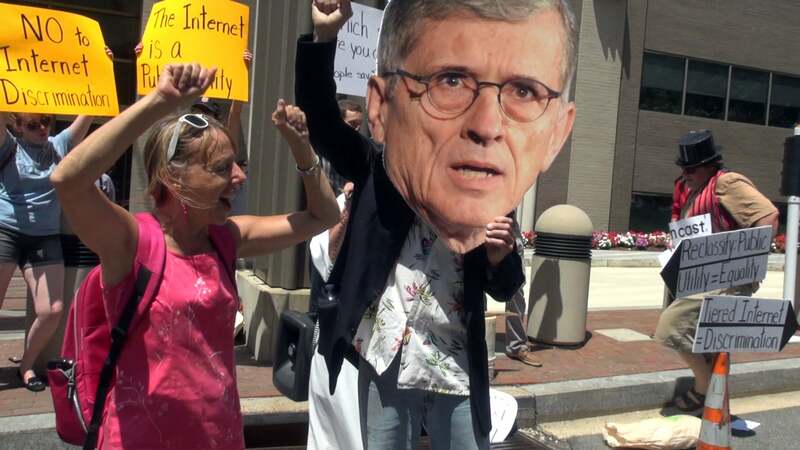 A protester wears the face of FCC Chairman Tom Wheeler, as others hold signs asking Wheeler to take a stand on net neutrality. “Tom Wheeler can either be the one who goes down in history as the one who saves the Internet or commodifies and destroys it,” said organizer Kevin Zeese. The protest outside FCC headquarters aimed to emphasize that Wheeler must make a choice on net neutrality and “cannot be in both worlds,” Zeese added. The FCC is seeking public comment before implementing rules that would limit net neutrality regulation to a “case-by-case” basis, evaluating whether specific companies’ practices are “commercially reasonable.” Supporters of net neutrality say the dispute process could prove slow or ineffective, allowing corporations to profit in the meantime and stifling innovation. A federal appeals court in January struck down a previous set of rules that would have banned broadband discrimination, stating broadband providers’ classification exempts them from treatment as common carriers. The demonstration, organized by various populist and grassroots organizations such as Popular Resistance and Code Pink, urged Wheeler to reclassify broadband as a common carrier, which would give the FCC the regulatory power to impose rules like those struck down in January. Net neutrality supporters staged a tug-of-war, with protesters portraying regular users on one end of the rope, and telecommunications interests on the other. Public comment for the FCC’s net neutrality proposals ends July 15. Net neutrality supporters worry the proposed regulations would tacitly allow the creation of “Internet fast-lanes,” which would prioritize higher speeds for certain services at the expense of others. “It’s gonna make it very hard for people to really spread their news, share information, organize and mobilize if we’re stuck with a tiered Internet where the wealthy get more,” said Zeese. Organizers suggest those interested comment on the proposed regulations at FCC.gov/comments. The FCC could not be reached for comment.